Seattle-based coffee chain, Starbucks has opened its first store in Italy on Piazza Cordusio, Milan in the historic Palazzo delle Poste. A tribute to the culture of Italian espresso coffee that inspired Howard Schultz to create the Starbucks Experience 35 years ago. 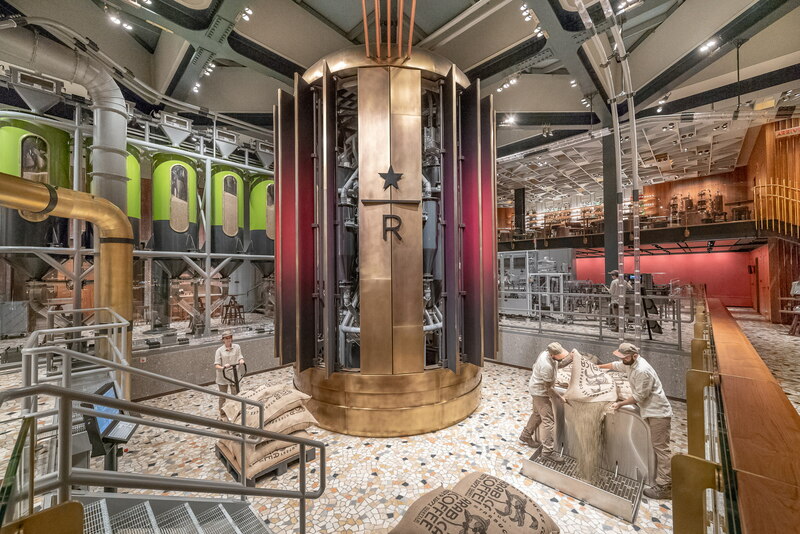 Starbucks, the famous American coffee roasting and coffeehouse chain, has arrived in Italy with the Reserve Roastery format. 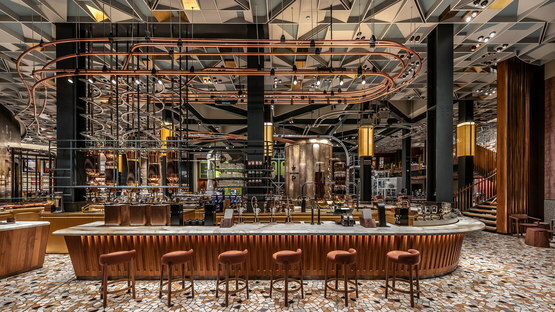 An all-embracing experience, of which only two others exist in the world: the Seattle Roastery, which opened in 2014, and the Roastery in Shanghai, which debuted in 2017. When Howard Schultz, chairman emeritus who brought Starbucks to where it is today visited Milan in 1983, he was captivated by the typical ambience of the Italian espresso bars, centres of the neighbourhood social life, providing a real sense of community and human connection. The location of this immersive experience, as he terms the Roastery, is the former Palazzo delle Poste in Piazza Cordusio, Milan. The Palazzo is in the city centre, very close to the Duomo, the Galleria Vittorio Emanuele II, the La Scala theatre and Castello Sforzesco. The prestigious property with its historic 20th-century facade was originally home to the Italian stock exchange. It was also the last of the buildings by the architect Luigi Broggi that completed the ellipse of Piazza Cordusio. It was built between 1899 and 1901 and has undergone a major facelift covering the whole area of 7000 square metres. This new conversion embraces the finest finishes, design architecture and cutting-edge technological standards that have earned it LEED GOLD certification. You enter the 2300-square-metre Roastery from the ground floor and are faced with what we can only call an amazing show. 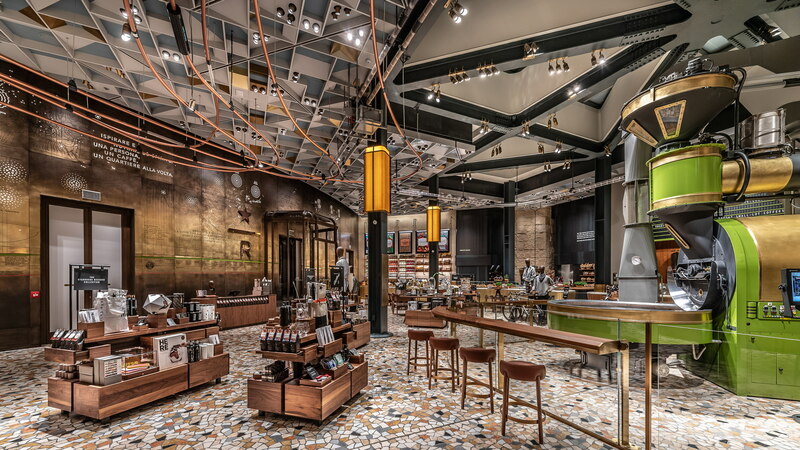 Liz Muller, chief design officer, Starbucks oversaw the project which stems from a focus on the Milan surrounds to respect the original architecture. As Muller explains, the design team spent a year living and breathing the city of Milan, working closely with dozens of local artisans to bring to life this retail experience that engages each one of their customers’ senses – sight, sound, touch, smell, and of course, taste. At the heart of the environment is a fully-functioning Scolari coffee roaster, manufactured just a few kilometres outside the centre of Milan. To the right is the main bar, where classic espresso beverages mingle with cutting-edge coffee innovation. The impact of the interior design is further enhanced by the natural light, which, just like the original design 120 years earlier, filters through the leadlight windows in the ceiling of what used to be the great hall of the Stock Exchange. As well as being able to find out more about Starbucks history and its coffee through an augmented reality (AR) experience, customers can enjoy the full range of Roastery coffees outside on the building’s terrace in full Italian style, protected by the portico of the Palazzo delle Poste, which is adorned by a striking statue of a siren – the symbol of the Seattle-based chain – completely hand-carved in Carrara marble by Tuscan sculptor Giovanni Balderi. 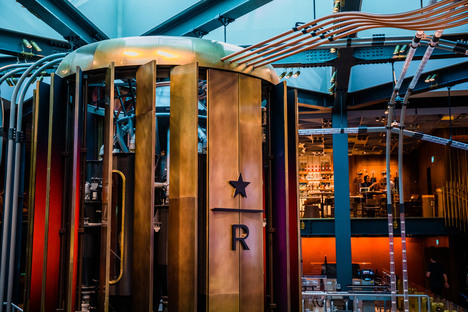 The Starbucks Roastery, therefore, has gone with a customised approach to comprehensively connect with the city of Milan and Italian culture, from its art to its culinary tradition, using attention to the original building and consideration for the urban context as the focus for the architectural project and the marketing strategy.